Move over Ziploc baggies - there are a slew of containers out there now that can hold, organize, and chill kids' lunches, keeping them fresher and tastier. Moms are no longer limited to packing things that fit inside a standard plastic sandwich bag. These creative lunch container solutions allow you to expand your repertoire of healthy lunches. Gone are the days when a peanut butter and jelly sandwich was the standard lunchtime meal. Kids now bring everything from salads, to soup, to yogurt and more. These containers feature unique designs that make packing your child's healthy lunch a little easier. The appeal to this set is that it allows you to send your child to school with a healthier, lighter lunch. Cold soups, a salad, or anything else that is more suited to a bowl than a baggie will fit in this roomy container. It's compact and dishwasher-safe, and it all fits easily into the insulated tote so that you don't have to worry about spoiling. There's even room for a sandwich in the tote after you've packed the bowl and tumbler. Whether you want to pack a large bunch of grapes, a fruit salad, or a cold summer soup in the bowl, you could. On top of that, you don't have to worry about spills, since the lids fit snugly and won't slip off easily. The Bento box is a traditional Japanese lunch box that has a divided container so that you can pack multiple foods in a lunch. This Bento Thermos takes that idea to the next level. The Thermos has several different levels, so that when put together, it looks like a regular Thermos. However, each cup has its own spill-proof lid with silicone seal. The Bento Thermos is designed to keep your meals cool - so go ahead and pack that yogurt, fruit, or salad. The Thermos has three different sections that each have a capacity of approximately two-thirds of a cup. In addition, the thermos has the typical drinking cup at the top - perfect for filling up with water or for instant soup. The Bento Thermos has its own carrying bag, but you can also just put your Bento thermos into your backpack and be ready to go. They come in sets of four and are available in both one-cup size and two-cup size. You've thought and thought on ways to be creative, healthy, and cutesy, but your child just wants a plain old sandwich. Don't worry, you can still be eco-conscious and send your child to school with the standard lunch fare of sandwich, chopped veggies, and chips with a side of candy bar. 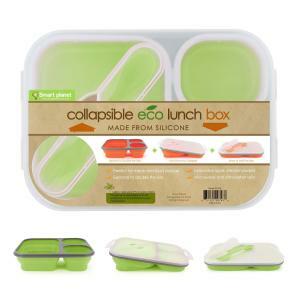 Basically, the collapsible lunch box is a divided container with a lid. It makes packing unique lunches easy since it has three different areas for food. It includes a spork that fits in the lid as well as a place to put condiments. So go ahead and pack a soup, salad or last night's leftovers. 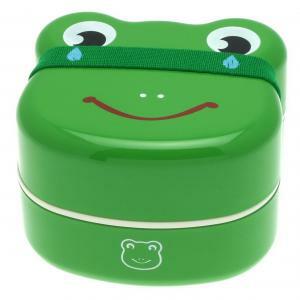 What makes this container so unique is that it doubles in size when in use, but once your child is done with lunch - it collapses to half the size, which makes fitting it into a homework-filled backpack or other carrying bag much easier. Does the sight of all those Ziploc sandwich baggies make your conscience cringe? Thankfully, you don't have to use them anymore. LunchSkins Reusable Sandwich Bags make packing sandwiches, snacks, and other goodies eco-friendly and stylish. The bags are made of certified food-safe fabric, can withstand several hundred cycles in the dishwasher. They are even made with patterns that appeal to kids. In addition, one baggie costs less than your box of traditional plastic sandwich baggies. The LunchSkins sandwich bags come in three sizes: sub size, sandwich size and snack size. Packing your child's lunch not only saves money but makes a positive impact on the environment. In addition, you can send your kids with healthier food. 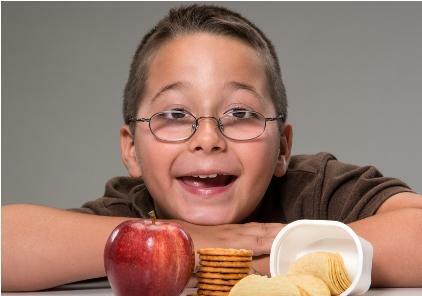 Packing a lunch also solves food issues such as allergies and sensitivities, so you're sure that your child feels as well as he possibly can for school. Moms have known for years that packing a lunch is a more economical, healthier way to go. Now it's eco-friendlier too.